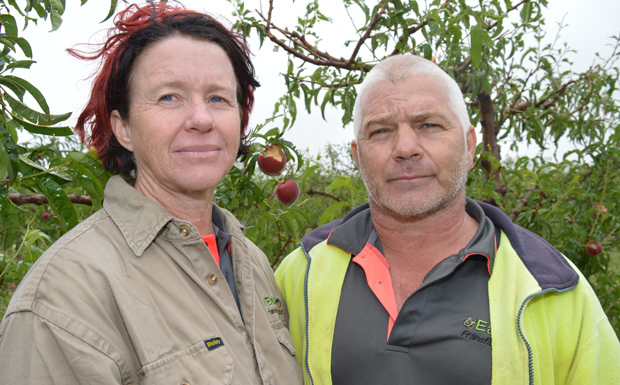 Kumbia stonefruit growers Teresa and Lindsay Francis are the face of Thursday’s wild storms in the South Burnett … losing more than $2 million worth of crops in the matter of just a few minutes. TV crews and politicians trekked to the family’s Easy 8 orchard on Kumbia-Brooklands Road on Friday morning to inspect the rows upon rows of hail-damaged peaches, the shredded and ripped hail netting and fruit now rotting on the ground. This was the second storm in less than a year the Francis family has faced. They lost avocados on a nearby farm during the Boxing Day storm which ripped through Kumbia last December. But that loss was tiny in comparison with what happened on Thursday. The family had only just begun a five-week harvest and the crop was looking terrific. 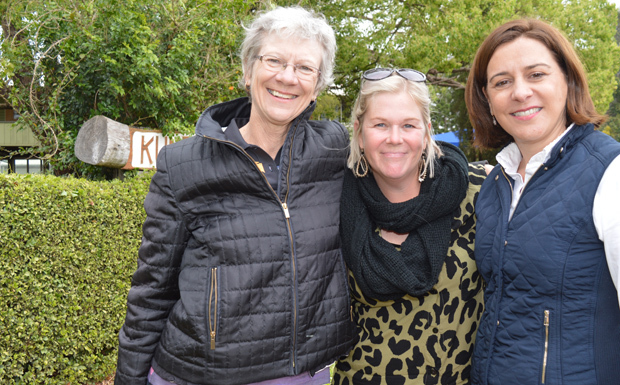 “We were getting only 3 per cent wastage,” Teresa said sadly. 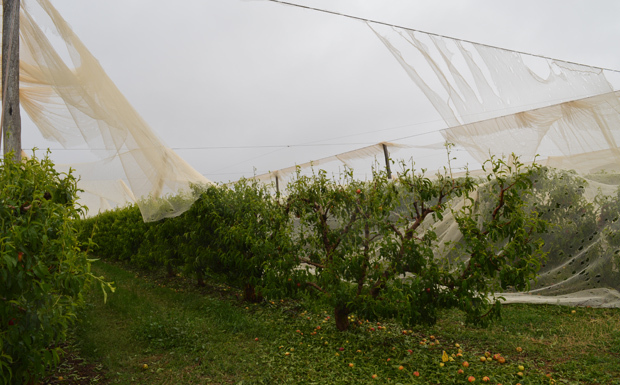 Lindsay said about two-fifths of the orchard wasn’t covered with hail netting and was totally wiped out. 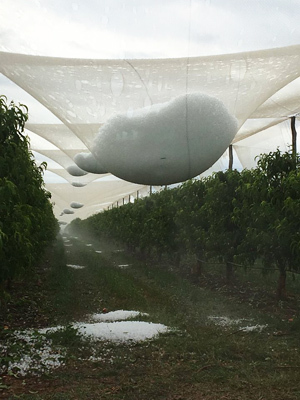 Another two-fifths were under older-style hail netting which didn’t handle the storm; between 80-90 per cent of this crop has also been lost. The rest was under different style netting and looks to have survived the huge hailstones which pelted the property. Lindsay said the stonefruit losses could be more than $1.5 million, with another $500,000 damage to a young avocado crop. To make matters worse, the crops weren’t insured – the first time for about 15 years or so. 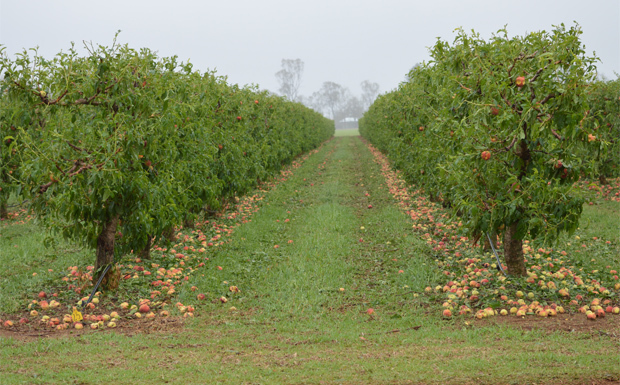 Lindsay said the fruit could only be insured for a set value of $30,000/ha but the crop was worth about $90,000/ha. “But at least if we get $30,000 it helps cover costs,” he said. “The trouble this year was that we were having hassles getting a policy through and eventually when they did say ‘yes, we will insure you’, we only had about three weeks between when the policy kicked in and when we would have had enough fruit picked off to make the policy not worth anything. About 50 seasonal workers who were expecting another four weeks work are now looking for new jobs, and many also suffered hail damage to their vehicles and caravans. So what will the Francis family do now? “We’ve been through this back in the mid-80s and went close to bankrupt … but the last years have been good with the advent of FMDs (farm management deposits),” Lindsay said. “We have got a little bit of money stashed away for an emergency like this but it’s only enough for one emergency. 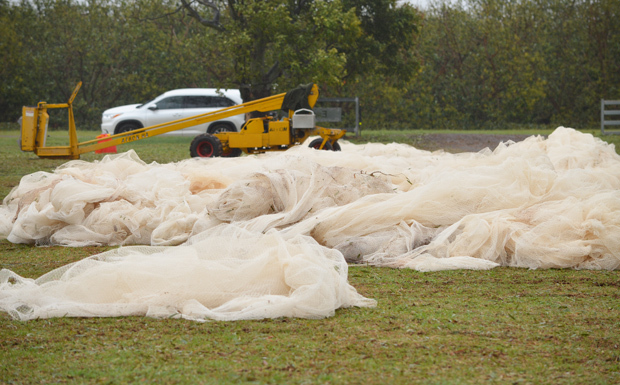 Lindsay said it cost about $44,000 an acre to install hail netting of the type which had proved effective in this storm. “It’s a lot of money and you don’t get an instant tax benefit from it. The netting is written off over five to seven years, the posts and wires over 10-15 years,” he said. “That’s our (problem with) putting money away to FMDs. You pull it out, you pay the tax on it as an income, you want to spend on things like (netting) but you don’t get the tax benefit of it. “It really kills your cash flow. Most businesses go kaput because of cash flow issues, not because of how they operate. 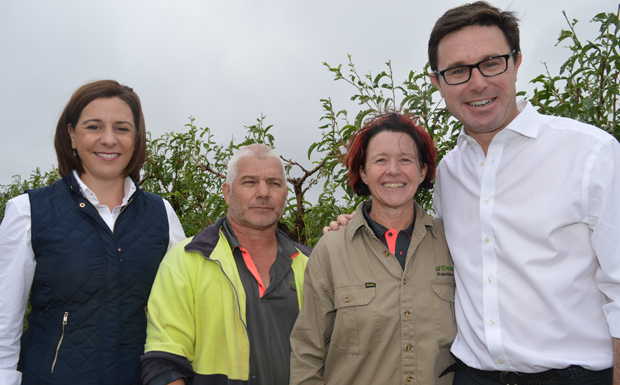 Federal Agriculture Minister David Littleproud – whose electorate includes Kumbia – said the Federal Government would stand “should-to-shoulder” with the community of Kumbia and the South Burnett. 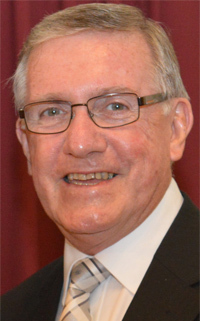 He said the agricultural sector had become far more sophisticated about financial management issues but there was a case to take to Canberra to discuss the infrastructure write-offs raised by Lindsay. Opposition Leader and Member for Nanango Deb Frecklington said the supercell storm had hit the South Burnett community in many ways. “Crops have been written off, properties damaged and animals injured,” she said. “The coming days and weeks are going to be tough for a lot of people as a massive clean-up continues and farmers try to recover crops. 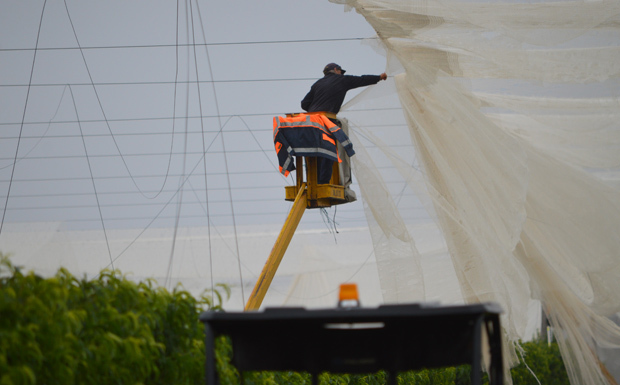 Stonefruit growers weren’t the only Kumbia residents to be hard hit by Thursday’s storm. Hail stones smashed windows at the Kumbia Race Club, Kumbia Memorial Hall and in private homes. At Kumbia State School, students watching the storm from an upper-storey classroom had to rush to take shelter under desks when “horizontal hail” smashed a string of windows along the side of the building. Many local residents also suffered hail damage to their cars; even vehicles parked under carports didn’t escape the effects of the wind-driven hail. Trees were also lost in the paulownia plantation on the outskirts of town. South Burnett Regional Council has advised Kumbia residents they can use the Kumbia Cricket Oval, opposite the Childcare Centre on Gordon Street, to dump green waste from the storms. This is the same procedure which occurred after last year’s Boxing Day storm. However, all household general waste must be left at the transfer station. Any resident who needs specific assistance with special waste items, should contact Council’s Waste Department on (07) 4189-9100. At the other end of the South Burnett, the small town of Tansey suffered damage when a tornado funnel “touched down” nearby. Homes lost roofs and sheds were blown apart. An estimated 800 chickens were killed at Cris and Lee-Anne Geri’s Rawganix Farm when their coops were either blown away or ripped apart. The cost of this damage has been estimated at $300,000. The town’s former abattoir was also destroyed. 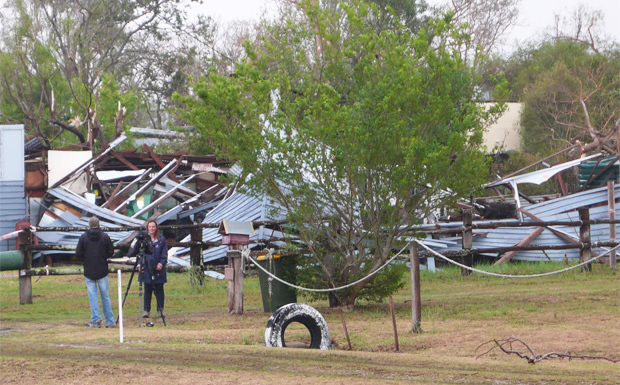 Houses and farm buildings in the Coolabunia and Hodgleigh areas also suffered during the storm. Water tanks were tossed around like toys, roof panels ripped off, and tree limbs speared through buildings. 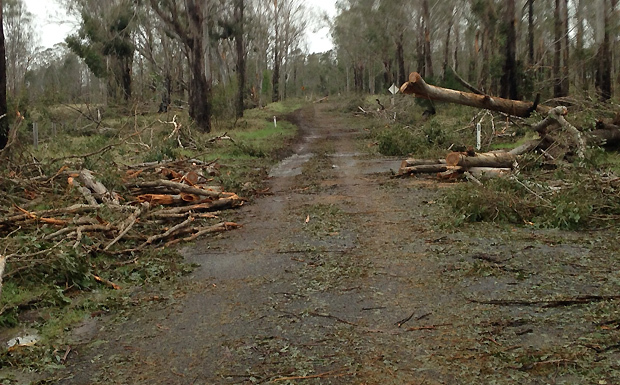 Fallen trees and storm debris forced the closure of the D’Aguilar Highway for many hours. Council announced the Coolabunia Saleyards would be closed until further notice because of storm damage. The Coolabunia rest area is also closed. Coolabunia was also the site of the only known injuries linked to the storm (see separate reports). Roads – including the Burnett Highway – were blocked by fallen trees and other debris in the Booie and Sandy Ridges areas as the storm cells tracked north-easterly from Kumbia though Coolabunia towards Manumbar. The one positive for local residents was the fact that creeks that haven’t run for months – or years – had water flowing through them. 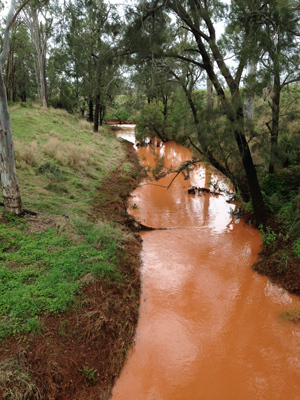 Some of this made its way into the region’s dams with both Boondooma and Bjelke-Petersen Dams reporting small inflows. More than 24 hours after the storm cells passed across the South Burnett, many local residents were still without power. 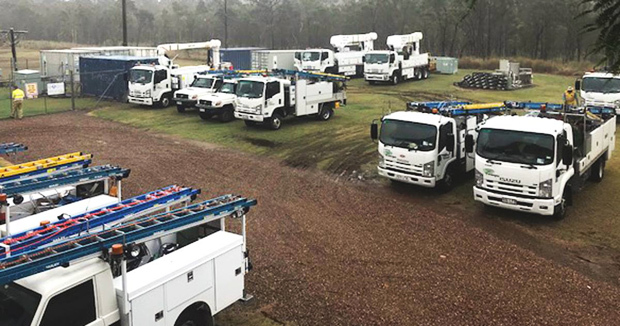 Ergon Energy spokesman Ty Marega said fresh crews from central and south-west Queensland had been brought in on Friday to help repair major damage to the network. At 10:00am on Friday about 1100 customers in the South Burnett and 700 in the North Burnett were still without power. By 5:45pm, 900 customers in the South Burnett remained affected. At the height of the storms, more than 6000 customers were blacked out in the South Burnett, part of an estimated 35,000 customers who lost power in the Burnett, Fraser Coast, Wide Bay and Sunshine Coast areas. “Damage to the Ergon network is significant. There are more than 50 lines and poles down around Kingaroy alone,” Ty said. “While we hope to get customers in parts of the North Burnett and Bundaberg back on Friday, others, especially in parts of the Fraser Coast and South Burnett, will likely be without power into the weekend. “We’re experiencing a lot of access issues to areas of the network in the South Burnett. In addition to the fallen trees, debris and boggy conditions are hindering our trucks getting to impacted areas. “Helicopter aerial patrols are underway around Kingaroy, Maryborough and Mt Perry to help us pinpoint restoration efforts and there’s 100 crews on the ground plus contractors, with more Energex crews on their way once they get on top of the damage around Gympie. “Due to the widespread nature of damage, the restoration of electricity to customers in the Fraser Coast and South Burnett areas may continue into Saturday and Sunday, weather and access permitting. Unfortunately there is a chance of more bad weather on the way to the region. “Please stay safe. Report any fallen lines to 13-16-70 or 000. South Burnett Regional Council said it was working with Queensland Police, Queensland Fire and Emergency Services, Ergon Energy, SES and community groups to provide a co-ordinated response to Thursday’s storms. Detailed information was being gathered and reports were being finalised. The impact and associated costs were yet to be determined. “We have received reports of significant damage to property, crops and livestock, particularly in the Kumbia and Coolabunia areas,” Mayor Keith Campbell said. BlazeAid volunteers have also offered to assist with the clean-up. For more information, contact Deputy Mayor Kathy Duff. Crisis payments are available through the Federal Government’s Department of Human Services for people currently receiving Centrelink benefits and whose homes have been left uninhabitable. Claimants must meet eligibility requirements and must contact Centrelink within seven days of the crisis to make their claim. Assistance for primary producers may also be available from the Department of Agriculture and Fisheries. 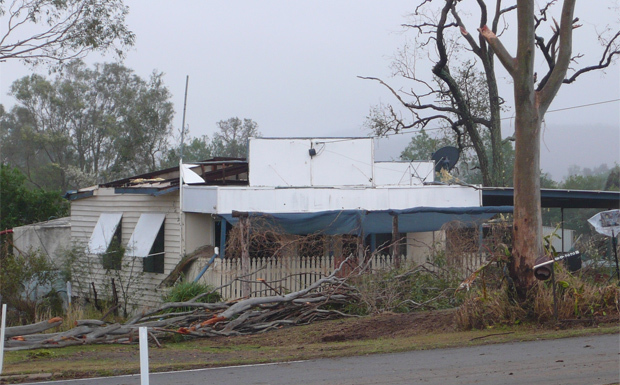 Where a primary producer has suffered significant damage from a natural disaster, they may apply for an Individual Disaster Stricken Property (IDSP) declaration. To obtain an IDSP declaration, contact DAF on 13-25-23 to arrange an IDSP inspection by a DAF officer. NB. The area has not been activated for NDRRA assistance. Fire and Emergency Services Minister Craig Crawford praised the efforts of SES and Rural Fire Service volunteers involved in the massive clean-up which will be continuing right across the weekend. “Overnight to 5:30am, there were more than 300 calls for assistance with 289 of these in the North Coast Region,” Mr Crawford said. “There were 170 callouts in Gympie and 53 in the South Burnett. I am available to help in any way with clean-up or repairs as required. Refrigeration mechanic by trade with restricted electrical licence. I can drive my station wagon into town where required. I am semi-retired, and live on the Gold Coast. 0402-469-961 or (07) 5535-7310.